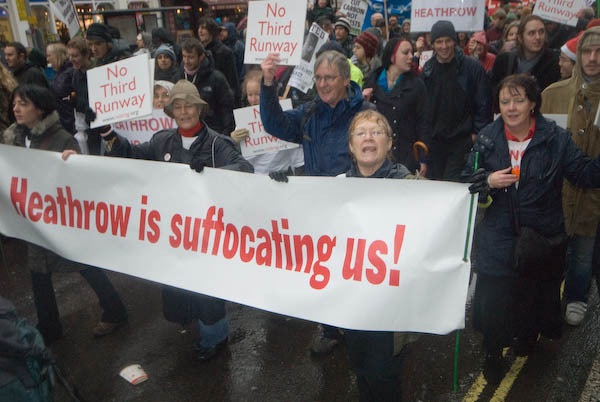 It was a protest not just at the expansion of Heathrow, but also at the false nature of the consultation process, where large parts of the consultation document were written by BAA and the government has already decided (barring horrific accidents – such as almost happened recently on the approach over Hounslow when a plane lost power and had to glide in, only just making the airport) on not just a 3rd runway but also a 6th terminal. 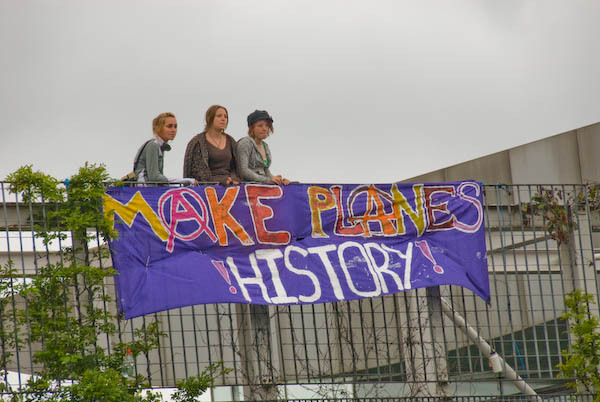 Apparently as well as hanging the banners, protesters also made paper planes of the secret documents they had obtained showing government duplicity and fixing of the consultation process and flew them down into the MPs car park. Photographically I don’t regret the missed opportunity, because I think it only too likely that any pictures I had taken of the event would have been at least as boring as those published in all the papers and Internet accounts I’ve seen. Perhaps one of the 3 men and 2 women who carried out the protest took a camera and made some better pictures? 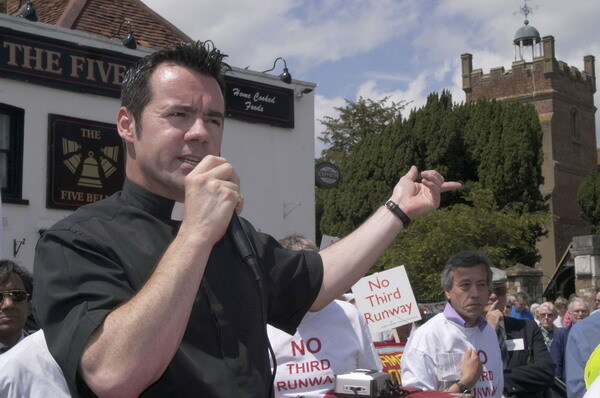 Of course the protest has been going on ever since the plans were first revealed to a stunned public, and I photographed the local protesters in Sipson and Harmondsworth in 2003. Of course Gordon Brown doesn’t like the demonstrators, deploring their actions, although in fact this and other similar protests have actually been very useful in pointing out gaps in security. Brown doesn’t like it because it reveals the facts about the skewed consultation process and the alliance between the promoters of unbridled airport expansion and the government (an alliance that started in the 1940s, when the public were first duped about the setting up of a civil airport at Heathrow.) He doesn’t like it because it highlights the absurdity of his claims to an environmental policy. Heathrow was always in the wrong place. Continued expansion over the years has made its position more and more untenable. It makes no more sense than Croydon. We should have begun a new airport to replace it thirty or more years ago. There shouldn’t be any debate at all over its expansion, but simply about how fast it can be run down. This entry was posted on Thursday, February 28th, 2008 at 11:23 am and is filed under My Own Work, Political Issues. You can follow any responses to this entry through the RSS 2.0 feed. You can leave a response, or trackback from your own site. Very good point that the protesters should take their own cameras. Bird’s eye view of protest from eg plane tail or parliament would indeed be interesting. Not sure how they diffuse it into the media though, so that it becomes reportage rather than propaganda? Since I wrote, Plane Stupid have updated their web site to include a number of videos from various sources. Their own video includes some cameraphone video from the rooftop, as well as sound – and this was also on BBC News. Its a very forceful example of how direct action can get extensive news coverage. There were 5 people on the roof and they got extensive coverage in every newspaper, all the TV and radio news programmes. Although much was about the security at the HoP, the issues also got some coverage. Monday night there were around 3000 people at a rally (and other protests earlier in the day) just a few yards away at Central Hall. Organised by HACAN ClearSkies and NoTRAG, speakers included Nick Clegg and Ken Livingstone, but I didn’t notice any media coverage. It got a tiny mention from the Press Association and a piece on Indymedia, but that’s all I can find on Google News about it.